Every adult has an opinion about teenagers, and many of those opinions slant negative. A good place for Christians to ponder the proper role of teenagers is to examine what the Bible says about them. What does the Bible say about teenagers? Absolutely nothing! The Apostle Paul wrote “When I was a child, I spoke like a child, I thought like a child, I reasoned like a child. When I became a man, I gave up childish things” (1 Corinthians 13:11). Paul simply reflected the culture of his day in which a phase of childhood development called the teenage years didn’t exist. Did you realize that the term “teenager” did not even enter the American vocabulary until the mid-20th century, in a Reader’s Digest article? Prior to this point in American history, and throughout many cultures of the world today, there is no such phase of life, as a person is categorized as either a child or an adult. “Teenager” is a newly-minted term that represents a society that has gone backwards in how it raises children and prepares them for a successful life that contributes to a better world. Clean your room every week. Do a daily chore (just one). Make sure the gas gauge stays above a quarter-tank. And to top it off, the article encourages parents not to expect teenagers from accomplishing all of them at once! Is this the pathetic level of expectation we have on our teenagers? Teenagers who are raised this way end up occupying Wall Street with the rest of their self-entitled, lazy friends. Brett and Alex would call them “Kidults.” But it’s not completely their fault. Parents have failed them and the Kidults don’t know any better. Do Hard Things contains so many great ideas that it’s difficult to highlight any one or two without leaving out many other insights. But I will try. The Harris’ identify one major problem as the “just do your best” trap. This is a favorite of adults. This phrase is deceptively disguised as loving and accepting encouragement that doesn’t hurt the fragile emotional state of teenagers. But teenagers aren’t children and they aren’t as fragile as we think. When teenagers know that no matter what the result of their effort, they will be told, “at least you did your best,” the results are complacency and just getting by. 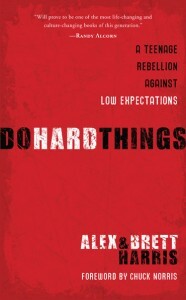 Alex and Brett state that this contradicts the heart of a “rebelutionary.” A rebelutionary pushes oneself to do more than is asked, expected or required by his parent, teacher, or youth pastor. To illustrate their point, the Harris’ share the stories of three teenagers: George, Clara and David. George’s parents died when he was eleven. He mastered geometry, trigonometry and calculus and by 17 earned a job as a surveyor of Culpepper County, Virginia. He performed this job, often alone, for three years using heavy logs and chains as his measuring tools. He was a full-fledged man at 17. Clara nursed small-pox patients and oversaw a class of students when she was 17. David captained a prize ship at the age of 12! George Washington, Clara Barton and David Farragut (the first navy admiral and hero in the Civil War) worked hard, accepted responsibility and chose a more difficult path while they were still “teenagers.” The intense work ethic they cultivated as teenagers developed mental toughness and leadership skills that allowed them to excel later in life. Developing a strong work ethic is a Godly virtue (1 Corinthians 10:31; Colossians 3:23). Parents who don’t expect their teenagers to work hard, to feel uncomfortable, or to experience failure, do not prepare them for adulthood when mommy is no longer there to tell them “at least you did your best.” If a person’s first tough challenges occur in a class from an impossibly hard college professor or a boss who has high expectations, then failure at this point could be devestating. It’s time for parents to rebel against American culture and raise their teenagers differently. True parental love is expressed by those who raise the bar of expectation and challenge their teenagers to “do hard things.” I highly recommend reading the book, and then having your “teenager” read it as well.